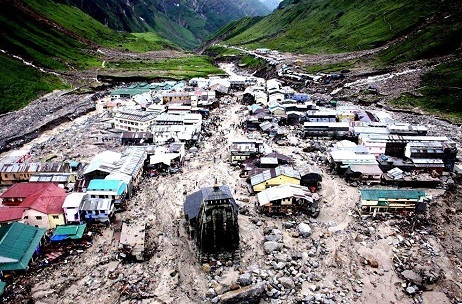 In what is being described as the ‘Himalayan Tsunami’, north-western India has drowned due to floodwaters as the country experiences one of its worst floods in history. Weather History – What led to the floods? On June 15, western trough ’10’ was leaving the northern areas of Pakistan while on the same day a low pressure system was over central areas of India. The western trough shifted its focus towards the northern areas of India on June 16 as it lied over Jammu & Kashmir and adjoining Pakistan. On June 16, it caused the west moving low pressure system to curve in a NNE direction, on June 17 the low pressure moved towards North-eastern Rajasthan and adjoining Uttar Pradesh as it started interacting with the western winds. The Himalayan Tsunami rages on! 500 people dead while 60, 000 stranded as per International Media. Wettest rain in five decades. 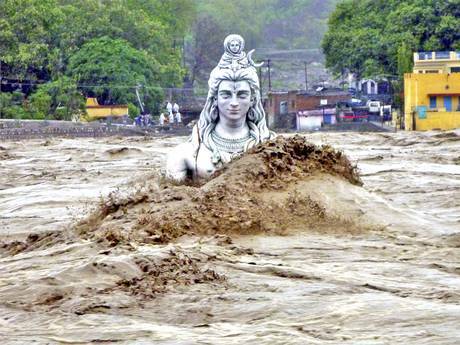 Worst floods in NW India in 60 years. 375% above normal rain in Uttarakhand. National capital New Delhi hit hard. Nepal has witnessed landslides and floods as 39 people have died due to similar conditions in the country. In short the same weather system has killed 14 people in Pakistan, 500 in India and 39 in Nepal. Before the Himalayan Tsunami, a short burst of severe weather was observed in North-eastern areas of Punjab especially the provincial capital Lahore where 102 mm (4 inches) of rain fell between June 14 and June 15, predicted by PWP in its update on June 9. The burst of heavy rain killed 14 people in the city. Lahore’s monthly average rain for June is 36.3 mm (1 inches) but this June a total of 153 mm was observed out of which 102 mm fell in few hours. Extremly sad event in india…late he saheh ap ne article likhna to start krdya..any way what about sindh weather when first spell will hit sindh?? Have always made article like that. Not seeing any rain for Sindh at the moment. These floods in India are another horrible result of the Pakistan-Arabia Dust Cloud, when the Cloud occupies the country of Pakistan and causes drought, heat, humidity and dust storms–meanwhile in India it stalls the monsoon and causes floods like these. Since the Dust Cloud is man-made, it is up to the people in Pakistan and Arabia to cut back on their animal grazing in the deserts, to allow some vegetation to cover the currently barren areas, so that the soil will stop getting airborne. Otherwise the whole region will continue to suffer with massive drought, massive floods, horrible heat waves with oppressive humidity and terrible dust storms. It is unnecessary to have to live that way, because all of that could be easily cured if people want to make the effort. You can see my research at http://www.ecoseeds.com/floods.html (2010 floods), http://www.ecoseeds.com/floods2.html (2011 floods), http://www.ecoseeds.com/2012drought.html and http://www.ecoseeds.com/2012floods.html. It is up to the people decide they do not want any more floods, droughts and dust storms, and take action to keep the soil on the ground, instead of in the air. Words of wisdom for sure, Thanks Craig! Did you hear that Pakistan made a record of planting some 847,000 seeds of trees in Sindh province! I wish such plantations happen on a larger scale and the people realize that they need the vegetation to sustain or we will go through tough times! This person writing the blog always drags most details and never bases any of his forecast on facts .. Rather, they seem to have been copied from other meteorological services or on his own preposterous assumptions .. I mean what the hell is the wettest rain? Or for that matter fast winds? English much? Positive criticism is always welcomed, your past comments had some abusive words! PWP does not copy forecast – PWP’s forecast are based on meteorological charts, maps, models, history and prevailing conditions (Images of such models are uploaded like in any other blog), you need these things to predict weather even famous blogs like Accuweather and Weather Underground do that, no angel comes and whispers in their ears about the upcoming weather. Almost all weather blogs do that! PWP had forecasted the June rains (duration, intensity etc) earlier than any other weather service (PMD predicted it only two days ago). PWP uses easy terminologies so that the common Pakistani can understand it. Sounds like you have a “jealous rival” here Babar bhai. PWP is by far the best in Pakistan weather forecasts and this blog will remain at top for me until and unless I find a better website than this, which I highly doubt. When someone does not like a TV show they switch to another TV show instead of watching that show, no one is forcing him to come to PWP! Yet they still come! In a few years this event will reach its tipping point. Where all the dust storms have gone? I’m missing them. We have not had a single dust storm in the month of June. Yes, I remember that in June some nasty dust storms come in Multan! So far there has been no important western system that could bring those dust storms while the monsoon moisture is also weak. tarim which clouds do you like? Better than ‘those’ NE clouds that come and go with little to no rain, temperature also rises due to them! These SW clouds don’t come in the afternoon lol. They only come in morning and at night. May allah help them and save our beautiful and beloved country from this type of horrible nature/weather. Dear Ones ~ Please check the below youtube as to the natural/spiritual cause of the Himalayan cloud burst.